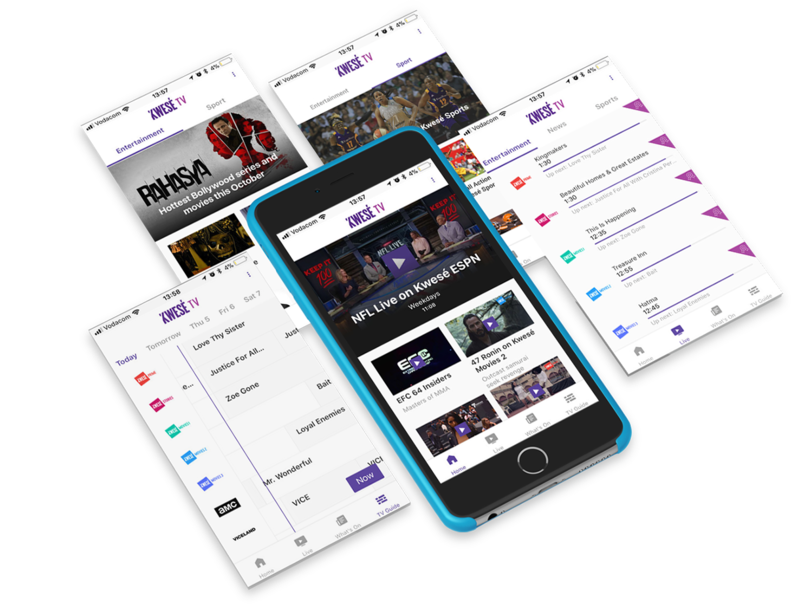 Kwesé, the pan-African OTT broadcaster, decided to create a new app that provides their VOD and live channels to all their TV subscribers. We built a new multi-channel app, making several changes during the build process, as their business model changed regularly. The finished app integrated their Squadeo player, which required two versions: Live and VOD which incorporated DRM via Verimatrix. We incorporated a CRM for billing management, Alpha Networks for content permissions and worked with Thumb Tribe, a team of web and backend developers who integrated endpoints for their live streams, EPG, and hosted URLs. We also integrated AppsFlyer, an analytics tool used by their marketing team, and Facebook SDK. Since launch in March 2017 they have added full SSO, VOD library and Geo Blocking. Kwesé Free Sports is a free sports version of the app and it reached 10,000 plus downloads in less than two weeks.